Sometimes things seem to be going so well, better than you could imagine and just too good to be true. Just when your mind starts to think those thoughts it is usually when “too good to be true” is a reality. Three and a half weeks before the Lifetime Fitness South Bech Triathlon, I was running more volume and intensity than I ever have previously in my training. 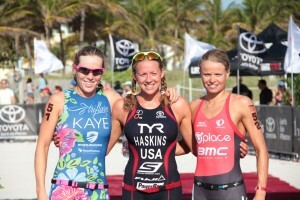 I raced a sprint race in Sarasota followed by a great long run training session a couple of days later. My calf seemed to be a little sore after the long run and I was hesitant to complete my next hard run session as I was afraid I may be pushing the brink. My body was telling me that I should back off. I mentioned to Nate how I was feeling and he was so happy with how things were going, he didn’t want me to deviate from the plan. Instead of walking off the treadmill, I pushed on and sure enough at the end of the workout I suffered a minor calf strain. As minor as it sounds, it required ten LONG days off running. I suffered a calf tear in 2010, which required eight weeks off running. I knew I had to be careful, let the tissue heal and not have any set backs because this would risk me being able to compete in my next race in three short weeks. Over the ten days, I searched to find physios in Florida and iced my leg. I became friends with NormaTec MVP every evening after Caroline went to sleep and tried desperately not to be stressed out and remain positive. It was mentally tough because prior to this setback, training had been going so well. My body had been feeling great and I was devastated that I may not be able to compete in the first race in the Lifetime Series. Several nights I woke up unable to sleep and sat out on the back porch with my leg in an ice bucket at 2am! I said prayers at night and knew that at the end of the day with whatever happened, I had my family and that was most important. I was very lucky that I was able to see my Physio I had been seeing in Missouri. She was cheering on the Cardinals in South Florida, so my husband and I drove down to see her. She had helped me tremendously after Caroline was born from the birth. In addition, she was helping me with compensation injuries from the previous ten years of racing. After seeing her, I felt much better. I also realized that much of the root of the problem began in my right hip. My right hip had a tendency for restrictions before pregnancy, but now I have to make sure that my hips do not get out of line. I believe that is where the problem started, so I will be sure to stay on top of keeping my body in alignment during all the hard training, especially since I am still nursing. While nursing, my body creates relaxin, which makes my ligaments looser than normal (including the ligaments in my hips and pelvis). A week before the race, I did my first long/hard run without pain. At this point, I knew in my mind that I could race. At this point I was just so happy to get to the start line healthy and ready to give it my best, despite a slight deviant from my training program. This is my tenth year of racing. People may assume after ten years that you have it all figured out; however, I am always amazed how much more there is to learn each year in a sport. This year I have much more to navigate in learning how to balance motherhood, returning to racing post pregnancy and nursing while training and racing. 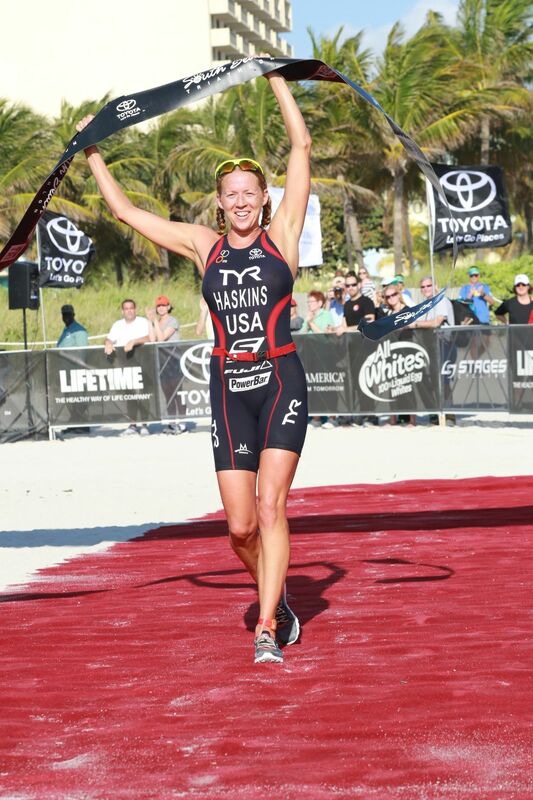 Crossing the finish line at South Beach Lifetime Fitness was the 32nd win of my career, but I crossed with so much more emotion than many of the other wins. The tougher the fight, the sweeter the victory. Remember to never give up on yourself, stay positive, continue to learn about your body. Following this path will set you up for success. I woke up Friday morning after a great night of sleep! I felt refreshed and headed off for my 3000 meter long course swim before the drive drive down to Miami. The plan was for me to complete a swim/run and for Nate to finish packing the Rav4. Fortunately, my mother and father in-law were in town to help watch Caroline during all the packing and pre-race training. 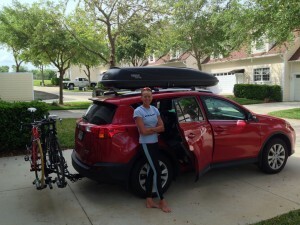 With two bikes, five bags of luggage and five people in the Rav4, we started our drive. I was very lucky to marry a bike mechanic and an organized packer! The drive down to Miami went well and Caroline slept for half of the ride. We were anxious to arrive and everyone, especially Caroline, was ready to get out of the car. We booked a condo at the same place we stayed at last year, a 2 bed/2bath with a huge kitchen!! It was 1.5 miles from the race expo; however, it was much more convenient to be able to cook your own food and it was less noisy being off the beach. After unloading the car, Nate and I headed to Pro Cycling to meet with other team Fuji athletes and speak with area triathletes about the race. To be honest, we did not do the best job with nutrition that day. I snacked on the way down to South Beach and by time I got dinner, I was overly hungry. I made up for it with a huge dinner of rice, sweet potatoes, chicken, asparagus and half of a chicken wrap. After the bike shop visit, we headed to the Lifetime VIP party at the Dream hotel. 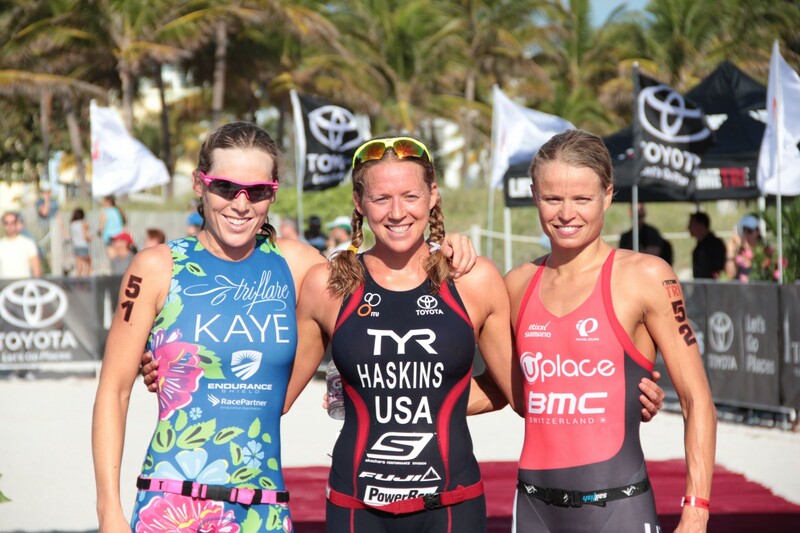 It was a spectacular view of South Beach and great to catch up with sponsors and athletes. Caroline loved all the lights and was very entertained “people watching” while walking back to the condo. Saturday morning, I completed my pre-race warm-up on the trainer. Trying to navigate the city streets are not my strength, especially with traffic. I did a short run off the bike and focused on increasing my hydration, since South Beach was much more humid than Clermont. I had the opportunity to speak with kids before they started their Tot Trot (a 100 meter beach run with profits going to St. Jude) and hand the kids their medals (Caroline may be able to compete next year!). I also spoke at the age group pre-race briefing and gave some inspiration for their race the next morning. After my own pre-race meeting, I headed back to the condo to relax and play with Caroline. I studied the course maps to get a clear mental picture in my mind the outline of the race. I did much better with my nutrition today, as I got in nutritious meals and made sure to snack throughout the day whenever my energy levels were feeling low. I was surprised how I wasn’t too nervous the night before, more of a focused calm feeling I seem to get. However, that always changes when I wake up in the morning! The alarm went off at 4:20. A little earlier than normal because I had a few extra things to do before racing to be sure Caroline would be ready and fed when she woke up. The air temperature was a warm, 75 degrees, but since the sun was not up yet it did not feel too hot. Because it was a warmer race, I focused on drinking two water bottles filled with Powerbar Perform in addition to my peanut butter and banana bagel. I added in extra salt to my water bottles for race day too. I packed a Powerbar Gel for race start and was confident that my nutrition was spot on. I biked with Nate down to transition, organized my spot and walked the transition area. I was surprised how much this race has grown. The transition area seemed to be close to 600 meters long!! I jogged the 1500 meters down to swim start for the point to point swim. The water was much choppier than normal, but knew to stay calm and was excited to get the race started! I had a good start and once we were swimming, it was so choppy I felt like I was in a washing machine. I don’t mind swimming in these race conditions and was fortunate that the sighting was made easy since we had to simply follow the coast line down. I led the swim side by side with Sara McLarty and ended up exiting just on her heals. I got onto the bike in first position and focused on riding hard and in a good aerodynamic position. Sometimes it is really hard to stay focused in a tight aero position when you are racing because there are so many other factors to consider like other competitors, rough roads, turns and traffic. I did my best, but I noticed as I fatigued, so did my ability to keep in a tight aerodynamic position. The bike was tough, with a little wind and a few hills on the causeway. I had two more bottles of Powerbar Perform on the bike. 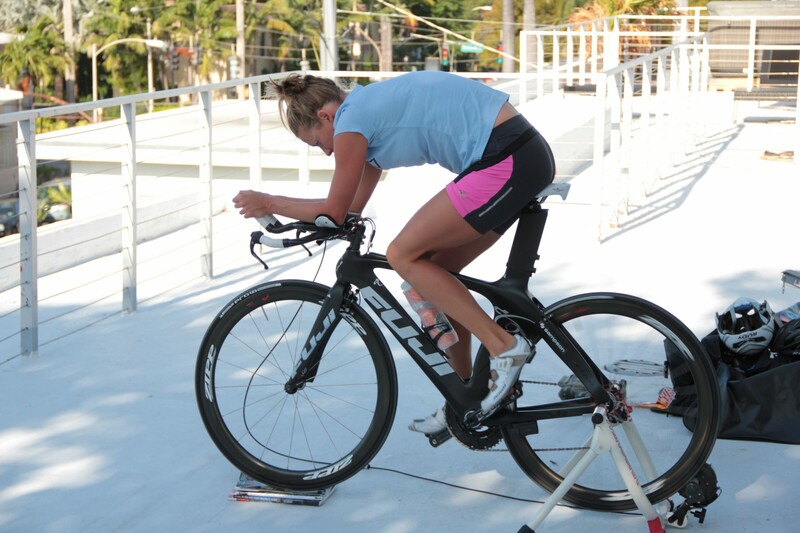 I always feel the bike portion is the toughest in most of my races! Here is my Quarq Power-file brought to you by Training Peaks. I exited off the bike in first, with 35 seconds over second place. I started the run off strong but calm. After the 1.5 mile, Helle Fredickson was 25 seconds behind me. She had put a little time into me at the start of the run, but I knew I had to just keep running strong. The run was different this year in that the second half of the run, almost an entire mile was on sand. This made for a tough run, especially since most of the sand running was at the end of the race. The sand was loose, so I had to focus on keeping my cadence high and trying to find the best route through the sand. 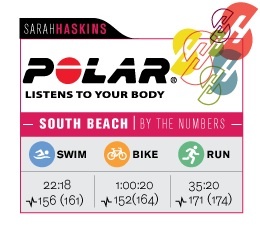 I used my Polar Heart Rate monitor to keep my heart rate low while running through the soft sand. I managed to keep my 25 second lead throughout the remainder of the run and the last mile ended up gaining back the 10 seconds that I lost on the first mile. 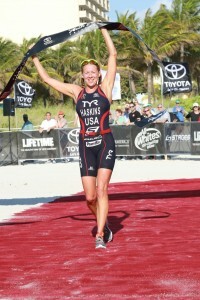 I felt strong on the run and was thrilled to break the tape! After the race I enjoyed a cool down swim in the beautiful, blue waters of South Beach. I always try to get in a little bit of a cool down if possible after a race, as my body will feel much better the next day. We had the awards at 11AM and I chatted with many of the athletes on the beach. It is so awesome to see so many people enjoying the sport of triathlon, those doing their first race or those returning back for their 10th. This race is also special with many proceeds going to St. Jude and helping to fight childhood cancer. Currently, we are all packed and headed back home! Tomorrow will be a day focused on recovery and getting my body back in the training groove in preparation for the next race in three weeks, St. Anthony’s Triathlon. Thank you to all the family, friends, therapists and sponsors for your support. I would not be here today without all your help. A special thank you to my mother, who not only gives me 100% support now, but without her 100% support throughout my childhood, I know for certain I would not be the person I am today. I hope to give Caroline that same support in whatever her passion is throughout her life. If you want to learn more about how I stayed fit during pregnancy please visit the BOB Strollers fitness center click here!